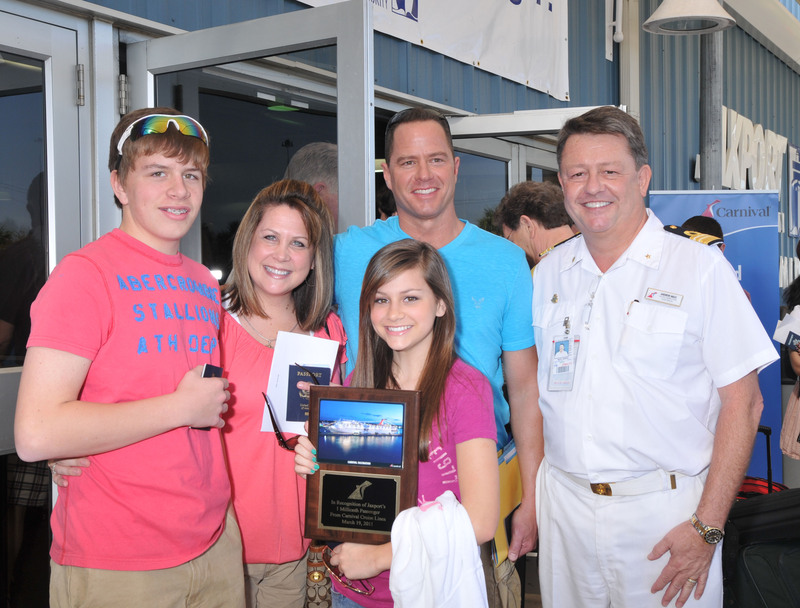 An Arkansas eighth grader starting her spring break vacation with her family on the Carnival Fascination became the one millionth passenger to embark on a cruise through JAXPORT’s Northside terminal this weekend. Emily Wilt of Siloam Springs, Northwest Ark., drove 12 hours with her parents and older brother to board the ship and was identified as the one millionth passenger by the terminal customer service crew shortly after embarkation began. Emily received a number of gifts and perks from Carnival and JAXPORT, including a commemorative plaque and special VIP treatment throughout their five-day cruise, which includes stops at the private Bahamian island of Half Moon Cay and Nassau. “I was really excited about our cruise before, but now it’s going to be even better,” Emily told reporters following a short ceremony outside the cruise terminal. Carnival Fascination Hotel Director Andrew Mace welcomed the Wilts aboard, recognizing Emily and the important milestone being reached. JAXPORT Senior Director David Kaufman thanked Emily and her family for choosing to cruise through Jacksonville and JAXPORT’s cruise terminal. The JAXPORT cruise terminal opened in 2003 and the Carnival Fascination launched the port’s first year-round cruise program in September 2008. The 2,052-passenger ship offers four-day cruises to Freeport and Nassau in the Bahamas, and five-day cruises to Nassau and Half Moon Cay or Key West. Carnival carries an estimated 170,000 passengers annually from Jacksonville.